Researchers from The Ohio State University have discovered that spinal cord injury alters the type of bacteria living in the gut and that these changes can exacerbate the extent of neurological damage and impair recovery of function. The study, "Gut dysbiosis impairs recovery after spinal cord injury," by Kristina A. Kigerl et al., which will be published online October 17 ahead of issue in The Journal of Experimental Medicine, suggests that counteracting these changes with probiotics could aid patients' recovery from spinal cord injuries. The trillions of bacteria that live in the gastrointestinal tract are collectively known as the gut microbiome. Disruption of this microbial community, or dysbiosis, occurs when nonpathogenic gut bacteria are depleted or overwhelmed by pathogenic inflammatory bacteria. Autoimmune diseases (including multiple sclerosis, type I diabetes, and rheumatoid arthritis) have been linked to dysbiosis, and it has been implicated in the onset or progression of neurological disorders, including autism, pain, depression, anxiety, and stroke. Traumatic spinal cord injuries have secondary effects or comorbidities, including loss of bowel control, that are likely to cause dysbiosis. The authors reasoned that if any changes in the gut microbiome occur, they might, in turn, affect recovery after spinal cord injury. Under the direction of Phillip G. Popovich at the Center for Brain and Spinal Cord Repair, the researchers found that spinal cord injury significantly altered the gut microbiome of mice, inducing the migration of gut bacteria into other tissues of the body and the activation of proinflammatory immune cells associated with the gut. Mice that showed the largest changes in their gut bacteria tended to recover poorly from their injuries. Indeed, when mice were pretreated with antibiotics to disrupt their gut microbiomes before spinal cord injury, they showed higher levels of spinal inflammation and reduced functional recovery. In contrast, when injured mice were given daily doses of probiotics to restore the levels of healthy gut bacteria, they showed less spinal damage and regained more hindlimb movement. The probiotics, containing large numbers of lactic acid-producing bacteria, activated a type of gut-associated immune cell–regulatory T cells–that can suppress inflammation. 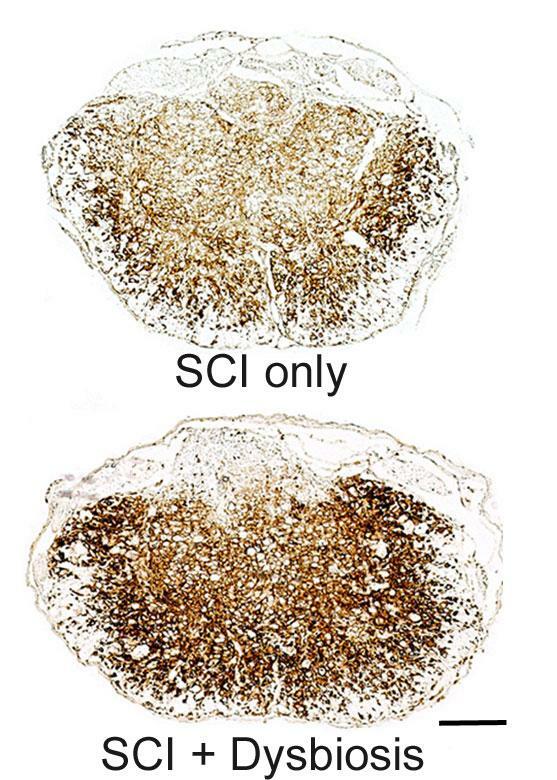 These cells could prevent excessive damage to the spinal cord after injury. Additionally, the probiotic bacteria may boost spinal cord recovery by secreting molecules that enhance neuronal growth and function. "Either or both of these mechanisms could explain how post-injury disruption of the gut microbiome contributes to the pathology of spinal cord injuries and how probiotics block or reverse these effects," Popovich explains. "Our data highlight a previously unappreciated role for the gut-central nervous system-immune axis in regulating recovery after spinal cord injury," Popovich continues. "No longer should 'spinal-centric' repair approaches dominate research or standards of clinical care for affected individuals." The Journal of Experimental Medicine (JEM) features peer-reviewed research on immunology, cancer biology, stem cell biology, microbial pathogenesis, vascular biology, and neurobiology. All editorial decisions are made by research-active scientists in conjunction with in-house scientific editors. JEM provides free online access to many article types from the date of publication and to all archival content. Established in 1896, JEM is published by The Rockefeller University Press. For more information, visit jem.org. Follow us on Twitter at @JExpMed and @RockUPress.